Before I pester you with yet another Christmas cookie recipe (be sure it will come BEFORE Christmas), I'd like to offer you an alternative to the notoriously sugary and buttery things that we eat in huge amounts BECAUSE it is Christmas. I don't blame anyone. I can say for myself that Christmas cookie baking and eating is contagious. Everyone does it, the shelves in the supermarkets are full, and I even get a little competitive when trying to bake THE BEST EVER Christmas cookie, in the hope for praise for my exceptional baking skills. And once they are baked, you can as well just eat them, right? However, here is an alternative. Since my childhood I have always associated Christmas with nuts. Only at Christmas we would have nuts in their shells and we would spend afternoons in the living room cracking nuts with a old-fashioned nut cracker and eat them together with small pieces of marzipan. 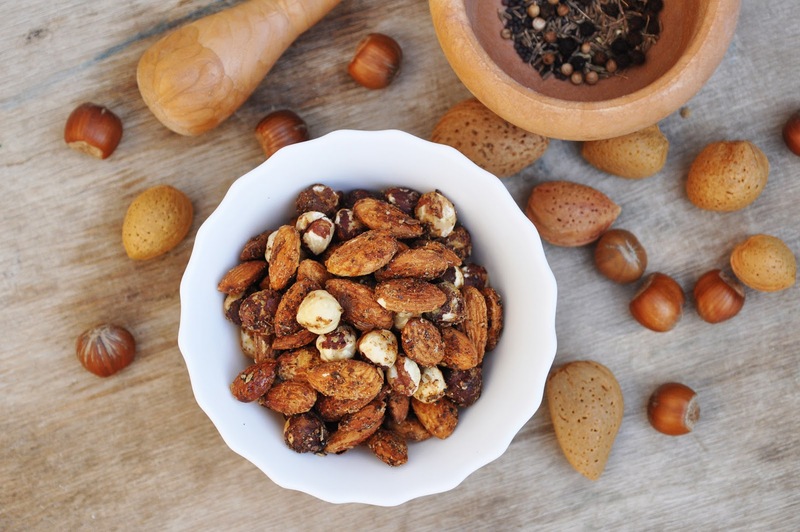 Nuts are full of goodness, and prepared in the right way, can be a truly amazing and delicious dessert or snack. These nuts are roasted in a pan and coated with the thinnest layer of sugar, just enough to make the most exciting spice mix hold on to them. Be prepared for a snack that is sweet and salty, savory and spicy at the same time. A delicious, satisfying and healthy snack that can surely keep up with all the other healthy and not so healthy Christmas treats. In a small skillet, toast coriander, fennel, mustard seeds, peppercorns, sesame and cumin seeds for a few minutes, or until they start to pop. Shake continuously throughout this process. Remove from heat and allow to cool for a minute or two. Place in mortar and pestle (or spice grinder) and process until coarsely ground. Place in a small container and stir in salt and cayenne pepper. In large pan, combine nuts and sugar over medium high heat. Stir frequently until sugar starts to melt. Lower heat, and stir continuously for 10 minutes, or until sugar starts to fully melt and cover nuts. Add spice mixture and continue to cook for an additional 30 seconds, until nuts are well glazed and pepper is well mixed in. Pour onto sheet of wax paper on a cooling rack and spread out. Allow to cool. Store in tightly-sealed container.